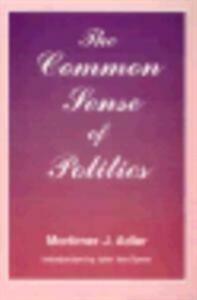 The first edition of The Common Sense of Politics described itself as a "just in time tonic for those of us who have given up on common sense as well as on politics and can no longer see the connection between the two." One has only to scan the pages of this 1996 edition to recognize that this book is just as appropriate and important, if not more. With the development of a European Community, the upcoming American presidential election, and in light of the recent celebration of the U.N.'s 50th anniversary, it is crucial that we, as citizens of the world, approach politics with common sense and a universal desire to improve our institutions toward managing and administering to a greater mankind. This book, built upon universal principles of a politics of common sense and for the purpose of restoring faith in the reform and improvement of our institutions, is the way toward perfect society and toward the bettering of the condition of man on earth.